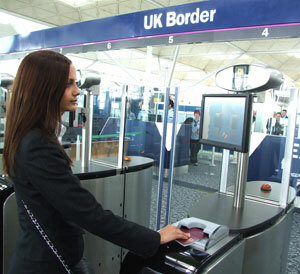 Dublin International Airport is currently piloting SITA’s iBorders solution to automate border control gates. The SITA pilot will see gates verify that passengers match the information of their passport, granting access to the country. The pilot is scheduled to run through October 2013. The iBorders system captures an individual’s biometric — facial recognition in the Dublin pilot — checks it against both the biometric data tethered to the passport and border authority checklists to validate access. Estimates from SITA suggest that the gates are processing as many as 1,000 passengers per day, in as few as 7.5 seconds each. The iBorders solution in the Dublin pilot is using NEC’s NeoFace face recognition software. Accompanying NEC’s NeoFace will be gates manufactured by Kaba. The hope for this combination of hardware and biometrics is a seamless verification experience for passengers as they no longer need to stand for a photo as many other systems require. The gates have already been deployed by both the Irish Naturalisation and Immigration Service (INIS) and the Dublin Airport Authority (DAA). SITA joined with Irish authorities to explore both passenger acceptance and gate efficiency after the European Union member states proposed a move to self-service border control using ABC gates. The adoption of new border solutions is two-fold; enhance passengers’ experience at airports while simultaneously strengthening border security. Similar pilots are already underway in 15 countries ranging from Singapore’s Changi Airport to Jamaica’s Norman Manley International Airport in Kingston, and Sangster International Airport in Montego Bay. Alan Shatter, Ireland’s Minister for Justice, Equality and Defence, suggests that many major European airports are contemplating similar automated gates for immigration control.